Excellent flight time upgrade for the Infinite Jib Eye-Droid 6, Eye-Droid 8, SkyJib 8 Elite, 3DR X8+, X8-M and DJI F550 Flame Wheel. Recommended for heavier payloads. Great run time, great acceleration from a stop and these batteries haven't even been broken in yet! These 4S Lipo battery packs are amazing. Unrivaled run time and exceptional power. They are a tight fight in the X Maxx, you will need to use a razor-blade and remove the foam in the battery compartment for a proper fit. Best Battery yet. I will probably make this pack the standard for my F550. 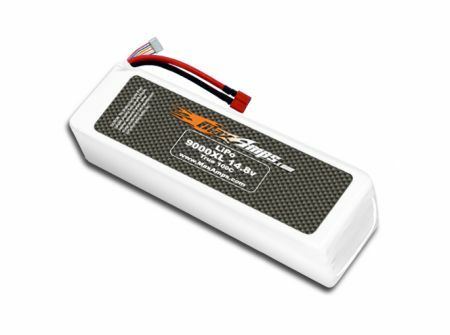 It gave me 1/3 more flight time than my 6000mah and 11,000mah (40c) batteries. Wonderful pack and fantastic customer service and support.Very knowledgeable technical advise from Evan. My DJI 550 WILL FLY AT LEAST 15 MIN.S With this pack. This thing is unbelievable. I have an a 550 almost at capacity and this gives it no less than 12 mins of flight time. Have 2, want a 3rd.